Our Healthy Homes program offers the following tips on keeping your home safe. You can download the document or print it for easy reference. The University of Connecticut People Empowering People (UConn PEP) received a generous gift from the estate of the Reverend John Evans, a lifelong Episcopal priest. The donor was Cherry Czuba, retired Extension Educator from Haddam, and niece of John Evans. He was a charismatic and fascinating uncle who endeared himself to many people. 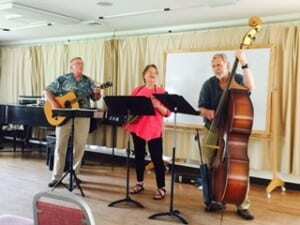 Throughout his long ministry he was called the “Singing Preacher” and “Musical Chaplain” because of his musical gifts, and “God’s Funny Man” by one of his former professors because of his wonderful playfulness. One of the most defining moments of John’s life was volunteering on Ellis Island. He lived at the Seamen’s Church Institute from 1948 through 1954. On Tuesdays and Thursdays in 1954 John took the ferry to Ellis Island and played and taught harp, banjo, guitar, piano, and music to the bedridden detainees through a self-taught numbering system. He was the last chaplain on Ellis Island. At a New York event, Ed Sullivan cited John Evans for raising the morale of seamen. Shortly after, the New York Sunday News carried a picture story of his use of the banjo in quelling a waterfront disturbance. Later in his life John donated two of his harps to the museum at Ellis Island. 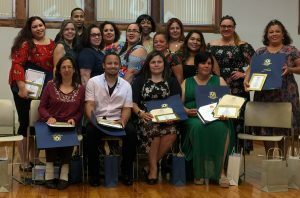 Graduates from UConn PEP’s Meriden program in 2018.
skills to lead and make a difference in their communities. It is an innovative personal and family development program with a strong community focus. The UConn PEP program is for adults and older teens, and is designed to build on the unique strengths and life experiences of the participants and emphasizes the connection between individual and community action. UConn PEP project description from a Bristol class. 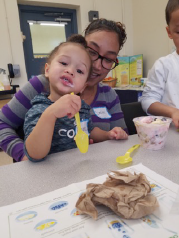 Because the UConn PEP program is adaptable to a variety of settings, the program is offered throughout the state at family resource centers, community agencies, discovery centers, faith-based communities and correctional institutions. Over one thousand people have graduated from the program in its 22-year history. Dr. Cathleen Love has coordinated the PEP program since Cherry’s retirement. “PEP thrived because Extension shifted off of the county-based programs to statewide programming, and that was through the vision of our administrators at the time, Dr. Nancy Bull and Dr. Roger Adams,” Cherry says reflectively. The strength of UConn Extension programs is in our network and our knowledge. We educate and convene groups to help solve problems in the areas of food, health and sustainability. Even in retirement John Evans helped serve others, a family tradition that Cherry continues today. Through his actions, John modeled that when people volunteer, they give back and develop friendships. Cherry really enjoys what she does as a volunteer and gives back however she can to many different organizations. The tradition of volunteering in Cherry’s family taught her to broaden her horizons, build relationships, have fun, continue to grow, and try new things. Communities depend on active volunteer bases to grow, improve, and serve their citizens. The UConn PEP program serves many first-generation immigrants. “Uncle John so believed in that feeling of being with immigrants, and understanding that we are all immigrants. John would love the fact that UConn PEP is reaching out to such a diverse audience.” John Evans passed away two years ago at age 98, the last of his generation in the Evans family. The gift to the UConn PEP program in his memory is helping the program reach new audiences, and John Evans continues serving communities through UConn PEP. Chris Collins speaks at the Meriden PEP graduation in June. Chris Collins moved to Meriden, Connecticut four years ago with his girlfriend and her two children. In his professional capacity he serves as a substance abuse counselor at Rushford at Meriden, an organization that offers a variety of outpatient programs and services, including counseling young adults about substance use disorders. A longtime friend of Chris’ invited him to participate in the University of Connecticut People Empowering People (UConn PEP) program. Because Chris wanted to learn ways to engage with the Meriden community, understand the school system, and make a positive difference, he agreed to attend. The UConn PEP program in Meriden was funded through the Nellie Mae Foundation. 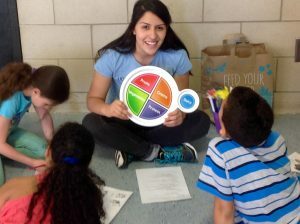 Other UConn PEP communities apply for funding through the Connecticut Parent Trust Fund or local resources like the Liberty Bank Foundation. UConn Extensionprovides training and support for community agencies, school districts, hospitals, family resource centers, and correctional institutions across the state offering the UConn PEP curriculum and course. Participants such as Chris come together for two hours a week for ten weeks to discuss topics including communication, problem-solving, values, parenting and other life skills that enhance parent leadership skills and community engagement. For Chris, the content and format of UConn PEP fit his lifestyle and addressed his interests. Because dinner and day care were provided, participation did not require additional juggling of work and family time. Chris was seeking an opportunity to be more involved with his family, the schools, and the community. UConn PEP was a vehicle to make that happen. In discussing the impact of the UConn PEP program on him personally, Chris recalled when his facilitator mentioned that the loudest voice is heard on most issues, he realized that unless he spoke up about his concerns than no one would know what they are. 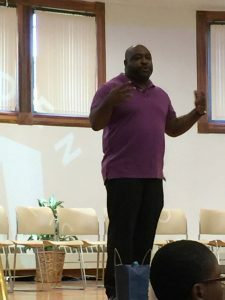 He said the resources and networking that are part of the 10-week program gave him perspective on power, and empowered him to become more involved. Learning about active listening also impacted Chris in that he realizes that listening first allows him to reflect on the issues before considering solutions. Parent leadership skills are central to the UConn PEP curriculum. Before participating in the program, Chris thought using the “hammer,” or authoritative style, to discipline children was the only approach. UConn PEP classes discussed other tools for caring about his children while still providing a safe home with healthy boundaries and using alternative disciplinary techniques. Chris said having more “tools” for parenting is helpful in working with his children. These tools also impacted how Chris became more involved in the schools. Resources and networks in the UConn PEP program gave Chris ideas of techniques to use in working with teachers and parents in schools. Participants in every UConn PEP program commit to finding and carrying out a community project. Chris shared that the impact of helping others makes you feel better than he could have imagined. His group collected books for children and they far exceeded the number of books they had put in their stated goal. When he assisted with the distribution of the books he said the smiles and joy he felt from the kids matched the smiles and joy of those giving them out. Chris is currently serving on a Local Advisory Committee and he uses skills learned in UConn PEP to engage members of his community. According to Chris, the community seeks him out when they have questions or concerns. The community knows he will listen and that he cares about their issues. With parent leadership and community engagement Chris believes the UConn PEP program impacted how he makes a difference in his family, in the schools, and in the community. Chris Collins along with Meriden Children First (MCF) Local Advisory Committee Members (LAC), with the support of Meriden Children First and the Meriden Public Schools, developed and implemented the UPSTANDER Awards. They established guidelines for nominating middle and high school students who through their actions have made a difference in the community. Chris along with the other LAC members worked on this project after one of the LAC members shared a story of her son being repeatedly bullied on his way home from school and another teenager deciding to walk him home every day. This intervention stopped the bullying. Chris and the other LAC members passionately turned a community story into action, by recognizing student UPSTANDER‘s who are doing the right thing without any expectation of recognition. Winners were chosen by the LAC after nominations and meeting rigorous guidelines. These award winners have stood out among their peers, going above and beyond with their actions. Thestudents received their awards in school and were recognized at the UConn PEP graduation on June 26, 2018. During the graduation Chris spoke about the character of each award winner and the meaning of the UPSTANDER award. He also shared how important it has been to him to have the chance to participate in the UConn PEP program to continue to give back to the Meriden community while collaborating with other dedicated parent leaders. 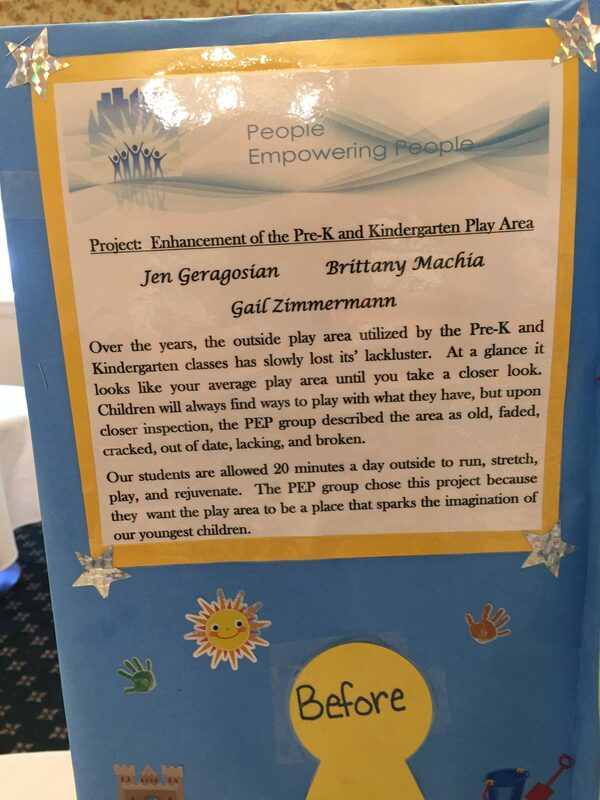 Chris and the other MCF UConn PEP graduates have gone above and beyond continuing their leadership journey in the Meriden school system and community. In addition to graduating from UConn PEP, Chris is a member of Meriden Children First Local Advisory Committee. He and the other LAD members have continued their leadership training by attending a public speaking workshop with Paul Vivian, 12 hours of Race and Equity training through National Conference for Community Justice (NCCJ) and attending a Nellie Mae conference. UConn PEP is an example of how a research grant can turn into over twenty years of service to the state. 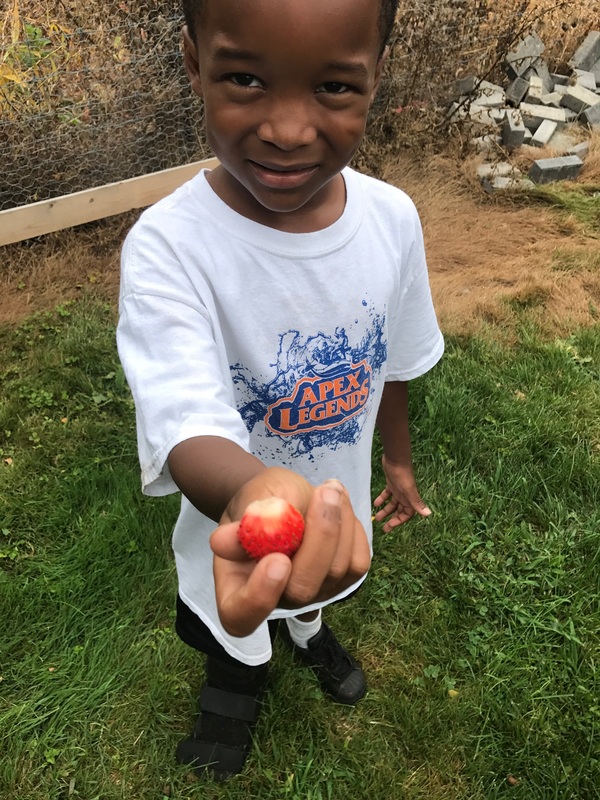 UConn Extension received a USDA State Strengthening grant in 1996 to create, deliver, and evaluate a parent leadership program in Connecticut. 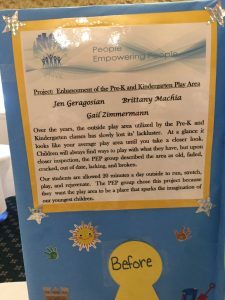 Since receiving that grant over 3,000 state residents have participated in UConn PEP, the parent leadership program created by the grant. Over 25 community agencies, school districts, family resource centers, and faith-based communities across the state have partnered with the Extension to offer the program. The research on the program suggests that the UConn PEP program was effective in influencing positive changes in participants’ life skills, personal relationships, and community engagement among an ethnically diverse sample. For more information on the UConn PEP program visit pep.extension.uconn.eduor email Cathleen.Love@uconn.edu. Nine out of 11 participants completed the year-round urban agriculture training in Bethel. They graduation ceremony is being planned for January 16th, 2018. Bethel urban agriculture program is currently recruiting new participants for the 2017-2018 course. There are six participants for the new round. Bridgeport urban agriculture program started on November 16th. Green Village Initiative (GVI) is collaborating with UConn Extension providing classroom and garden space. Thus far, 15 people are enrolled in the program. Knox Farms in Hartford has agreed to start the urban agriculture program in spring 2018. No date confirmed yet. 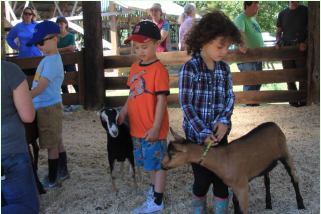 In response to requests from leaders and parents for the UConn 4-H program to incorporate Cloverbud-age youth, we ran a pilot program in 2017 for 5-6 year olds. With pilot year success, it is now an official addition starting 2018! 4-H Explorers is an age appropriate 4-H experience for five and six year-olds (plus seven year-olds/special needs youth who find this setting more suitable than a 7-19 age club). Explorers Club members do not have pro-jects or competitions. 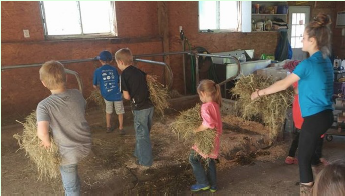 Instead, they explore all the different activities and experiences 4-H has to offer, and participate in events and meetings through activity-based, cooperative learning and positive encouragement. The focus of activity-based learning and feedback is to pro-mote the 4-H’ers’ confidence in meeting new challenges. Re-search on these age levels indicate the best way to build confidence is to provide many opportunities through activities that emphasize success, however small. 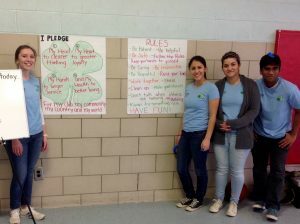 The CT Explorers use The Big Book of 4-H Cloverbud Activities (Ohio State University) and Clover Adventures: A Leader’s Resource Guide (University of Maryland Extension) curriculum. The activities in these books are specifically designed to meet the physical, cognitive, social, and emotional needs of this age group, while being framed in the 4-H experiential learning model. Busy, messy, and hands-on are the motto for Explorers Clubs! Each club receives the curriculum from their 4-H office when Leaders are trained and the club is enrolled. The CT 4-H Explorers at the Fair outlines how Explorers can participate meaningfully at the county 4-H fairs while not engaging competitively, and the CT 4-H Explorers Activity Summary provides a way for kids and/or clubs to reflect on their activities and successes. What were Ivan’s favorite activities this year? “Making pasta salad for Food Show,” and learning to hold a rabbit. Explorers from clubs in New London, Middlesex, Litchfield, and Fairfield counties participated in Giddy-up Games, Food Shows, Public Speaking, and Skill-a-thon. 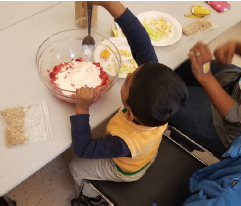 In their club meetings they visited farms, learned how maple syrup is made, learned about birds, played in some dirt (planting seeds), cooked, made dioramas, posters, and collages, and much more hands-on learning. Heading into the 2018 4-H year, we have 16 Explorers Clubs across the state and 74 kids. If you would like to learn more about CT 4-H Explorers or how to start a club, click here for the handbook or contact your county 4-H office.